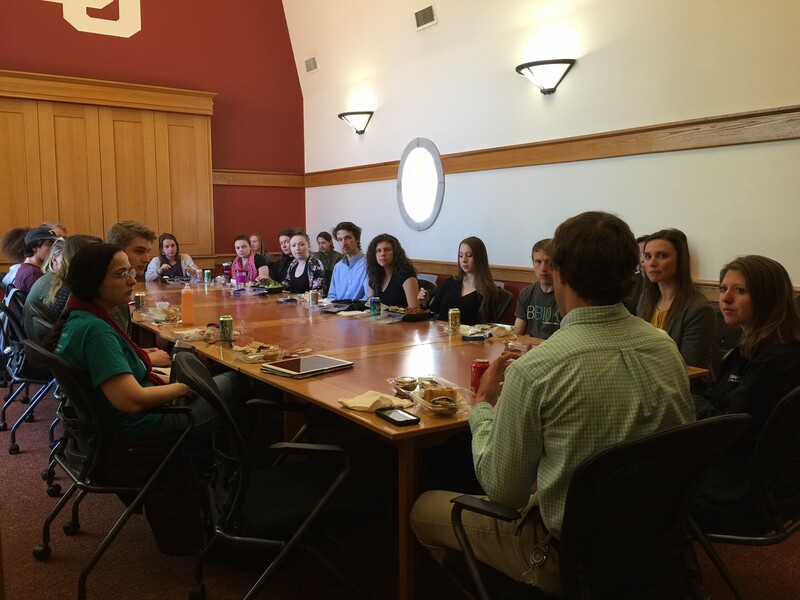 DU Alumni Visit Campus to Discuss Sustainability! On April 18, three DU alumni from Environmental Science and Geography visited campus to discuss careers in sustainability. Students from a number of different majors at DU joined us to celebrate Earth Month and learn more about the field! When asked about challenges associated with sustainability initiatives in Colorado, the alumni guests discussed the importance of individual habits – from turning off the lights when leaving a room to intentionally recycling and composting – and how they affect conservation efforts. The group also discussed some of the most rewarding parts of their work, which included applying knowledge gained in the classroom to truly understand how different environmental systems work together and the ability to give back to the community that gave so much to them while they were students. Going beyond challenges in the field of sustainability, each guest shared their story with the group, detailing how they got to where they are today. They highlighted the importance of networking when looking for an internship or job and how important building connections is in the search; one of our guests told the group about how she met BikeDenver at an on-campus lunch event. She followed up with them afterward and that informational interview opened up other opportunities for her. Stephen Rijo, who graduated with his MA in Geography from DU, reminded the group to leverage their status as a current student to get their foot in the door and explore possible projects to plug in to. The guests agreed that this strategy, coupled with scheduling informational interviews to gain insight about the field, proved to be effective for them. Stephen’s internships with BikeDenver and the RTD gave him access to data sets that he could use in his master’s research, all of which stemmed from being inquisitive and putting himself out there! Jessica Lally had similar advice; she was able to transition from intern to employee with Denver Recycles through networking, becoming involved in extracurricular activities at DU, being a creative thinker and communicating novel ideas while in her internship, running with her own projects, and seeing her own ideas through to implementation. When asked about strategies to stand out in the internship search, the alumni guests agreed that personal connections were incredibly valuable, especially when hiring managers are sifting through tall stacks of resumes. They also suggested volunteering with organizations that align with your values and interests, another great opportunity to build your network and foster meaningful connections. Our Dine & Dialogue on Careers in Sustainability was an excellent event, and we are so appreciative of the alumni guests and students who joined us!